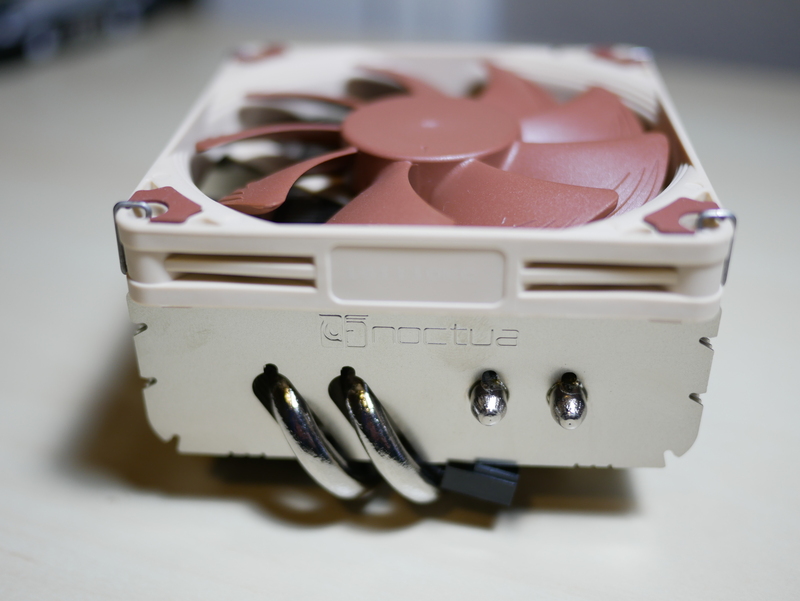 Noctua has been in the cooling business for years. They are well known for their CPU coolers in both small and large form factors that are not only efficient, but look good. 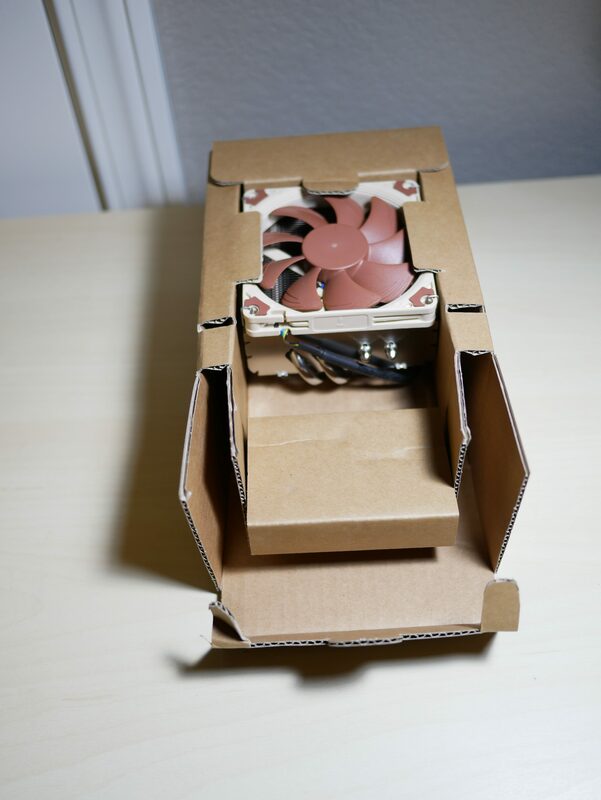 On the other hand, their case and CPU fans are well known with their signature brown and tan color, but once again are great for cooling almost anything down. 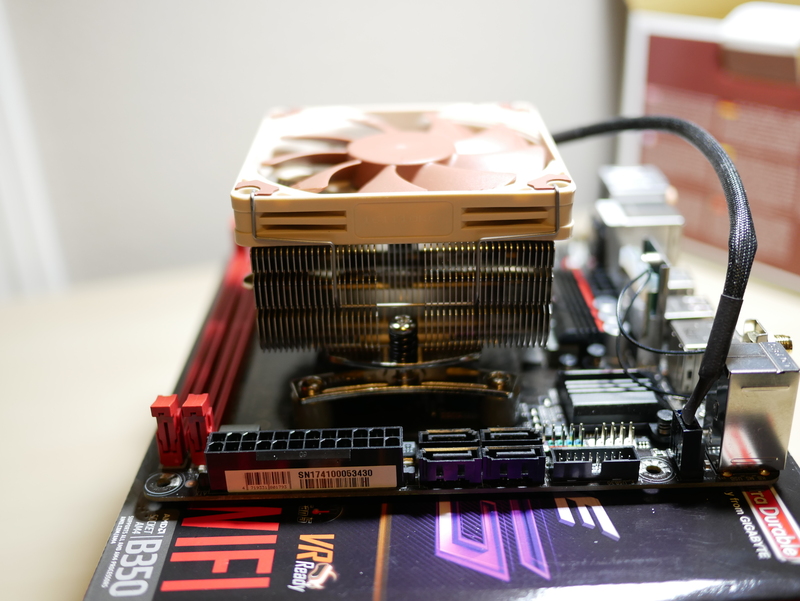 Today we will take a look at one of their new AM4 CPU coolers, developed for the small form factor community, the Noctua NH-L9x65 SE-AM4 ($50). Award-winning NH-L9x65 cooler: Tens of thousands of enthusiasts users all over the world swear by the NH-L9x65’s quality and performance. Recommended by more than 100 international hardware websites and magazines, it is renown for being one of the best sub-70mm low-profile heatsinks on the market. Dedicated special edition for AM4: The NH-L9x65 SE-AM4 brings the NH-L9x65’s signature quiet cooling performance to AMD’s new AM4 platform. With its highly compact design and low profile, it is ideal for cooling lower TDP AM4 CPUs in the HTPC or Small Form Factor cases. 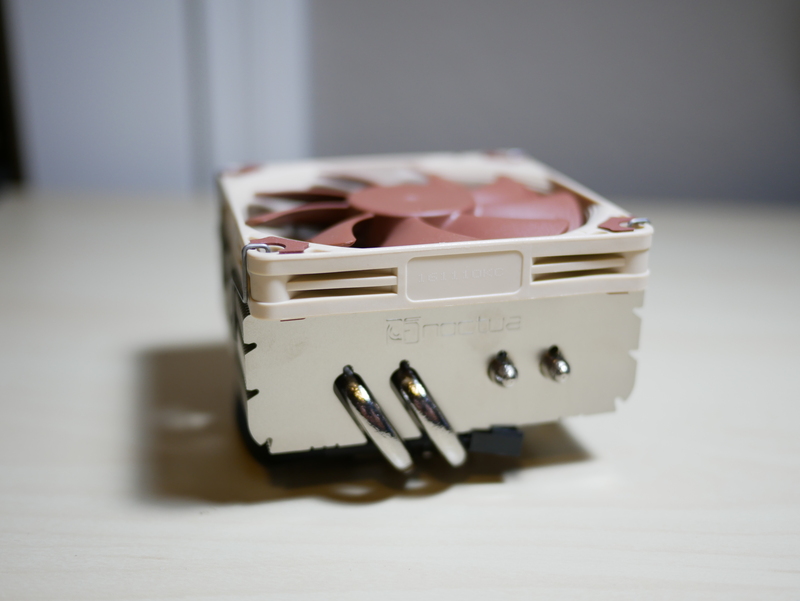 65mm low profile: Due to its compact heatsink and the 14mm thin NF-A9 low profile fan, the NH-L9x65 stands only 65mm tall, which makes it ideal for use in compact HTPCs or Small Form Factor cases that offer limited clearances for CPU coolers. 100% RAM compatibility: Being 95mm wide, the NH-L9x65 SE-AM4 complies with the AMD AM4 socket’s keep-out zone. This means that it won’t cause issues with chipset coolers and doesn’t overhang the RAM slots, making it fully compatible with tall memory modules. 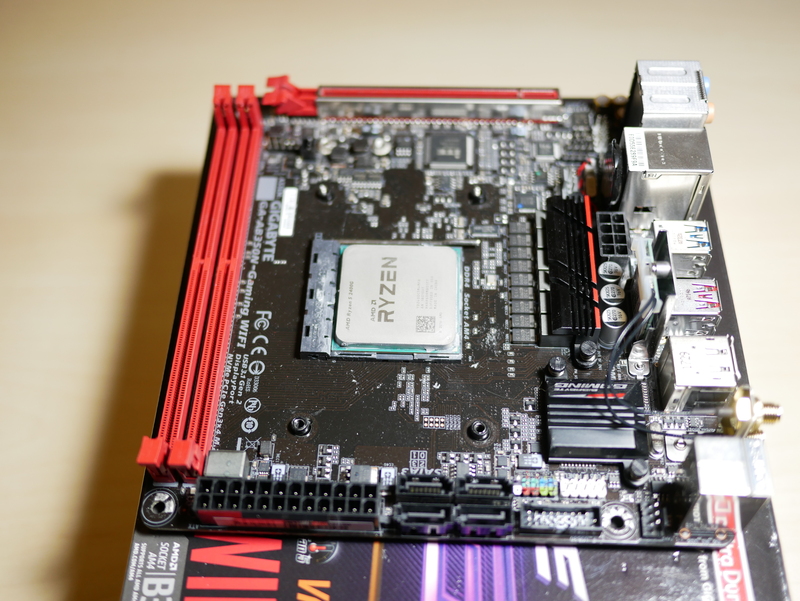 100% compatibility with PCIe card on mini-ITX: Many mini-ITX mainboards have PCIe slot sitting close to the socket zone. While larger coolers with 120mm or 140mm fans exceed this zone may block the PCIe slot, the compact footprint, the NH-L9x65 provides full compatibility with PCIe cards. 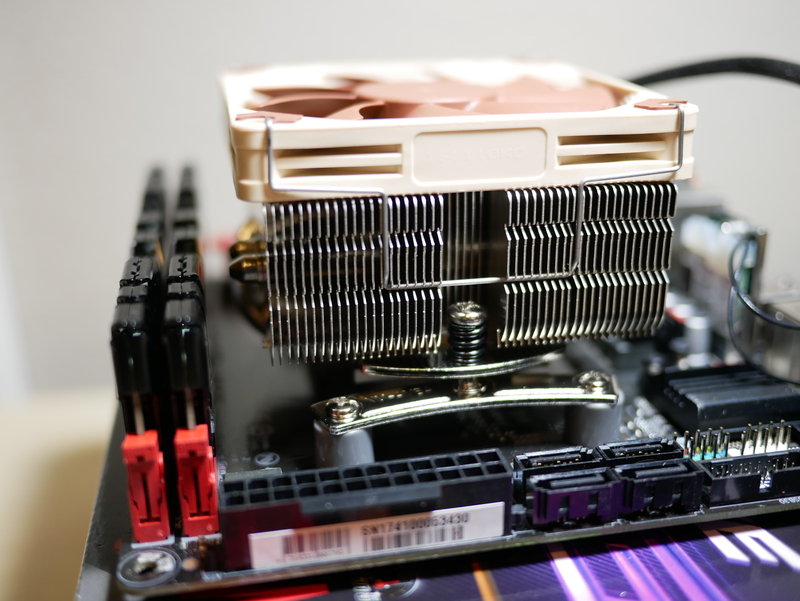 Easy access to near-socket connectors: Many low-profile coolers use larger fans or heatsinks in order to achieve sufficient cooling performance, but by protruding over the socket zone, they make it difficult or even impossible to reach near-socket connectors on tightly packed ITX mainboards. Thanks to its compact footprint, the NH-L9x65 provides easy access to all connectors and components. NF-A9x14 PWM premium fan: The highly optimized NF-A9x14 premium fan features Noctua’s proprietary AAO frame as well as sophisticated aerodynamic design measures. Supporting PWM for fully automatic speed control, the NF-A9x14 allows the NH-L9x65 to stay remarkably quiet. Low-Noise Adaptor: Allowing to reduce the maximum speed of the NF-A9x14 fan from 2500 to 1800rpm, the included (L.N.A.) makes it possible to achieve near-silent setups using CPUs with up to 65W TDP. SecuFirm2 mounting system: Noctua’s SecuFirm2 mounting systems have become synonymous with quality, safety and ease of use. 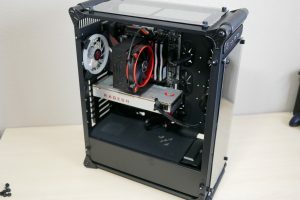 In order to achieve the best compatibility and to match the airflow path inside the case, the SecuFirm2 mounting for AM4 makes it possible to install the cooler either in standard orientation or turned by 90 degrees. NT-H1 thermal compound: Having received more than 100 awards and recommendations from hardware journalists around the world, Noctua’s NH-T1 is a proven professional grade TIM solution that provides minimum thermal resistance, excellent ease of use and outstanding reliability. 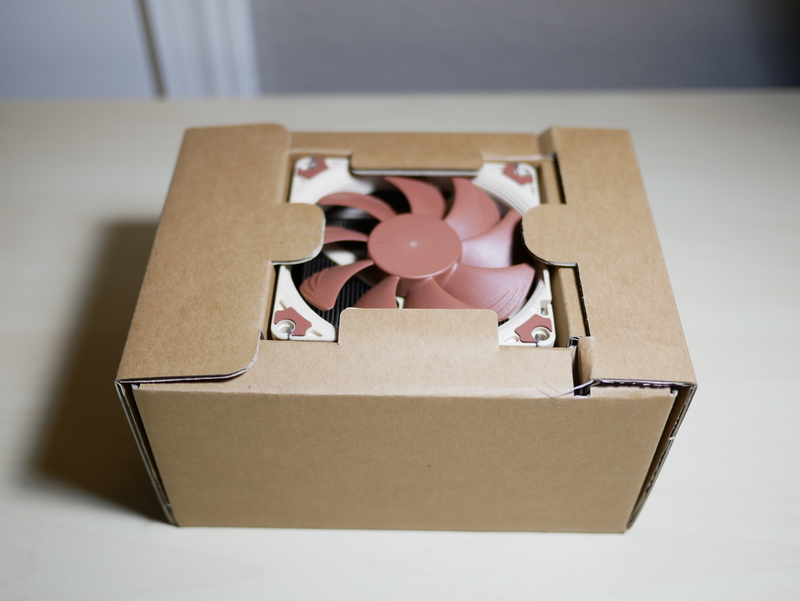 6-year manufacturer’s warranty: Noctua products are renowned for their impeccable quality and outstanding longevity. 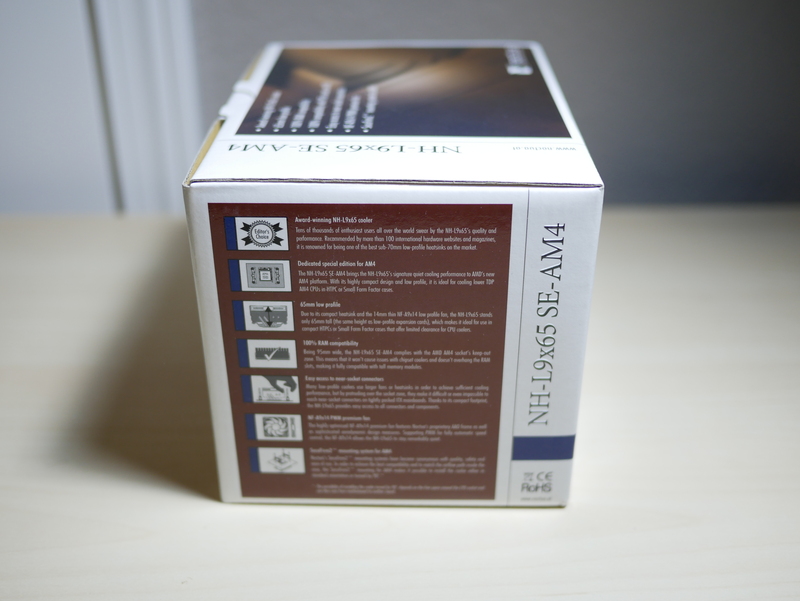 Like all Noctua fans, the supplied NF-A9x14 features an MTTF rating of more than 150,000 hours and the entire NH-L9x65 package comes with a full 6-year manufacturer’s warranty. 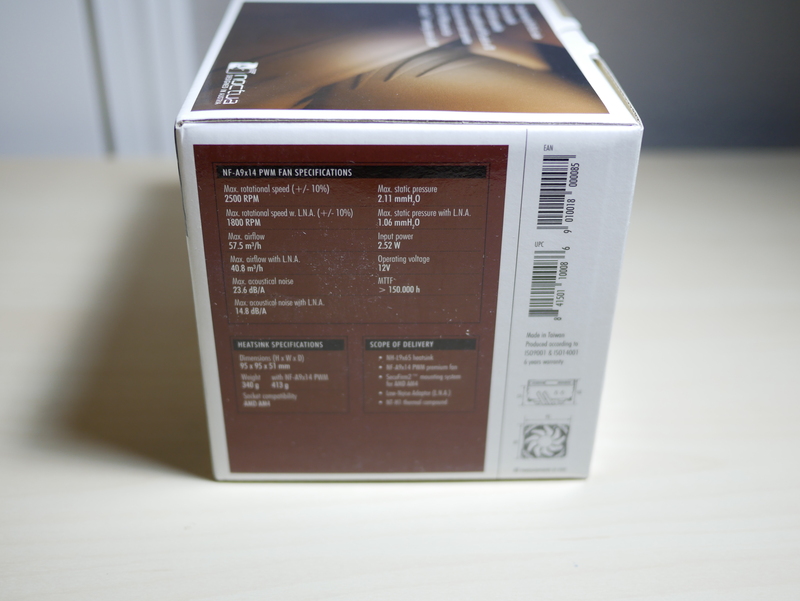 As we take a closer look at the box, you are greeted the standard Noctua brown and white themed box. box. 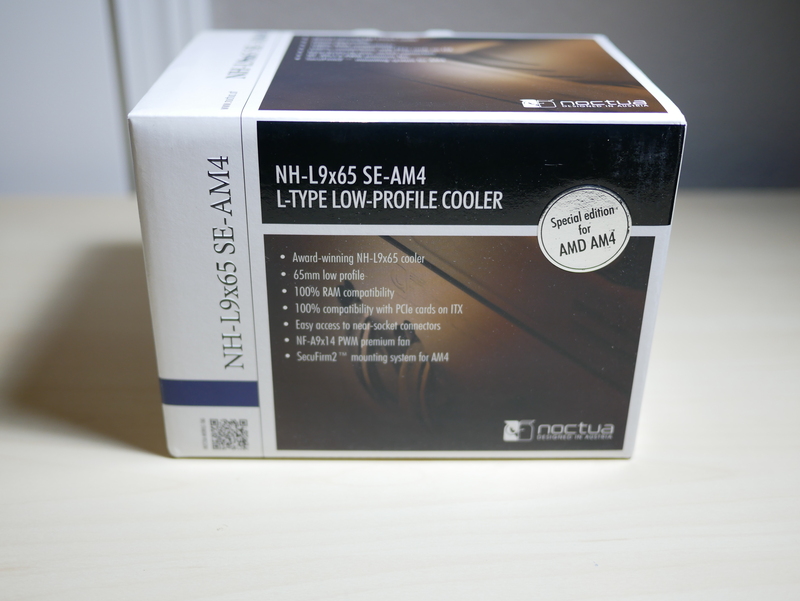 The front of the box has the Noctua logo, the features of the NH-L9x65 SE-AM4 and they also put a sticker to remind you that this cooler is a special edition for AMD AM4. The top of the box is nearly identical to the front. 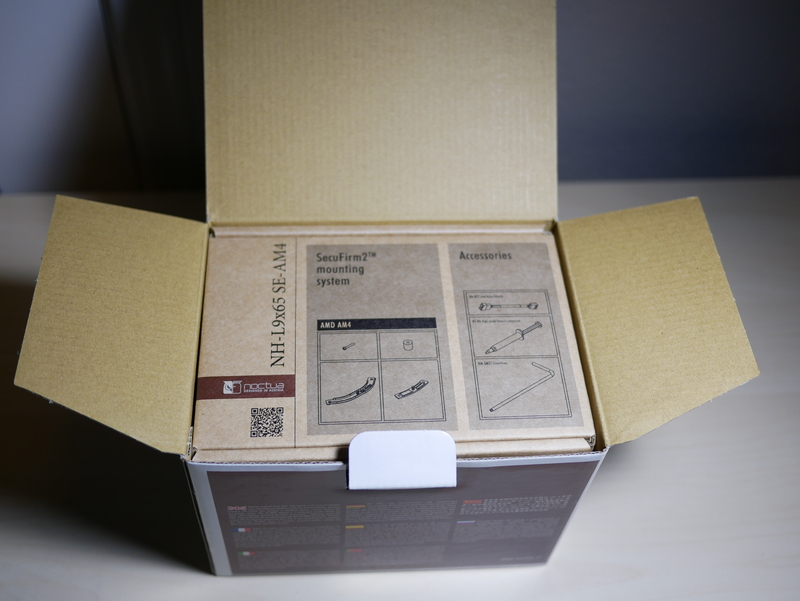 The right side of the box has explanations of the features. The left side of the box has the specifications listed. 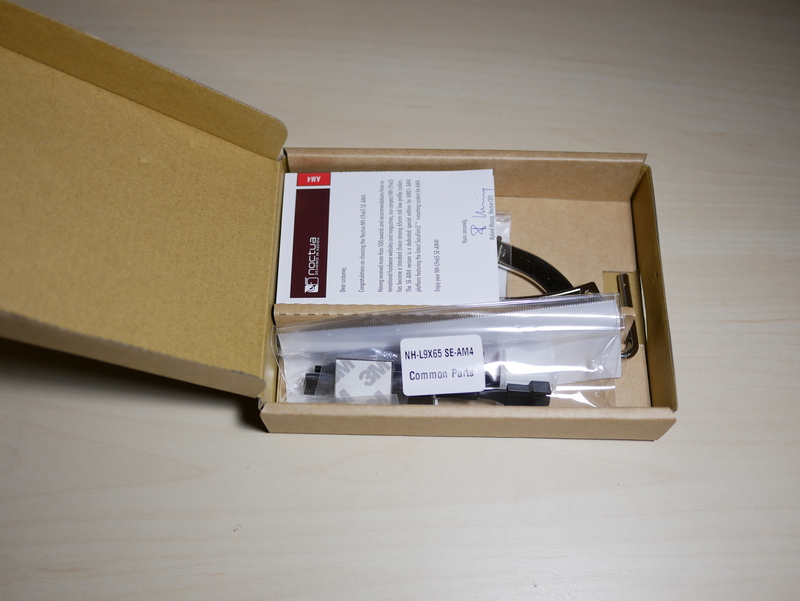 Opening up the top cover of the box, you first find the SecuFirm2 mounting and accessories box. There is a nice depiction of each item inside the accessories box. 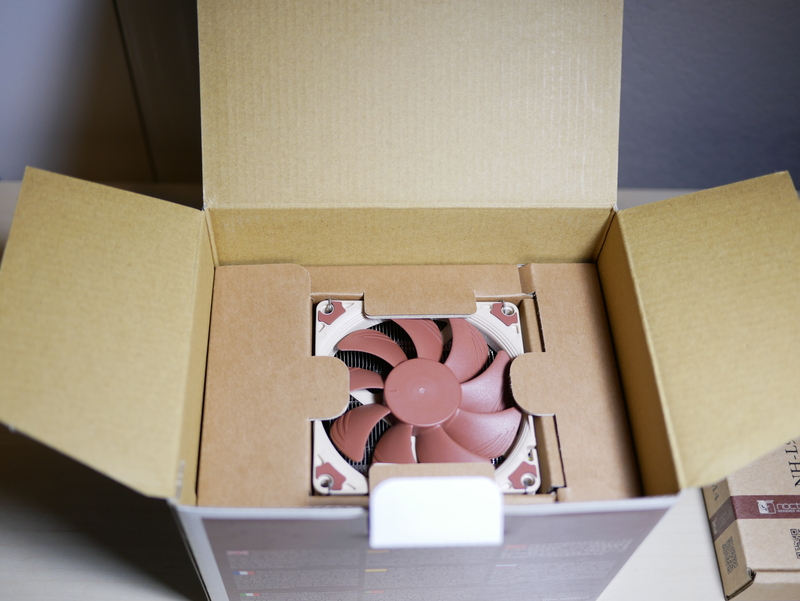 Below the accessories box you find the NH-L9x65 cooler secured in cardboard to protect the fan and heatsink during shipping and handling. Inside the accessories box you have your mounting and accessories separated in small bags with everything labeled. 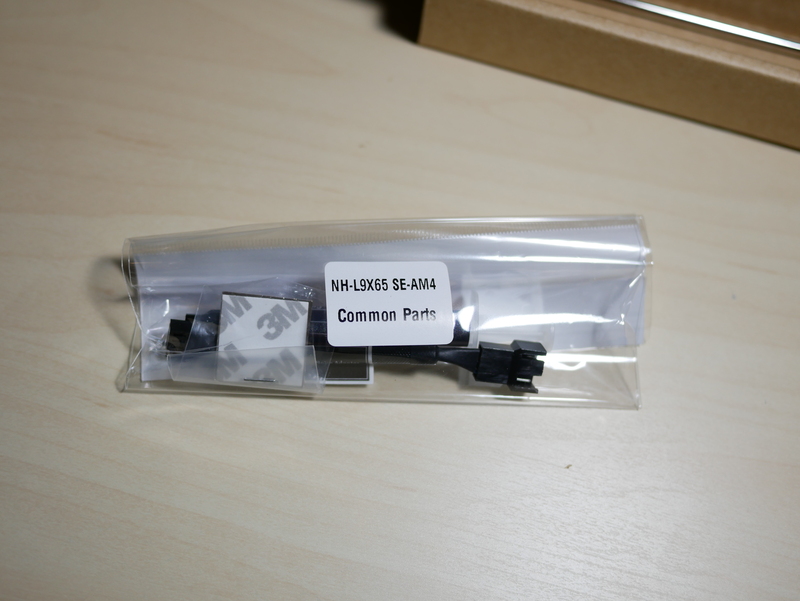 For your mounting kit, since this is the Special Edition AM4 cooler, you only get mounting that will work with that socket. A screwdriver/Allen key is provided in case you can’t find your own screwdriver around the house. 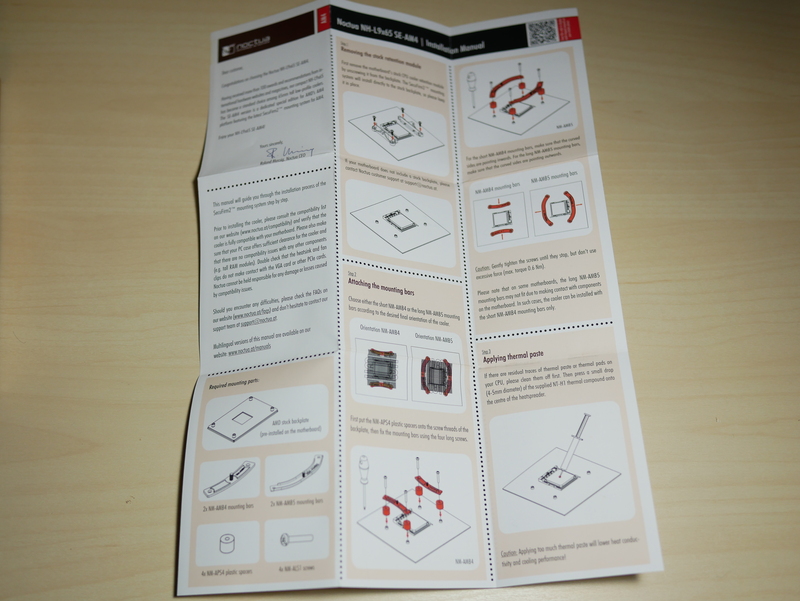 You also have clear instructions on how to install the cooler. 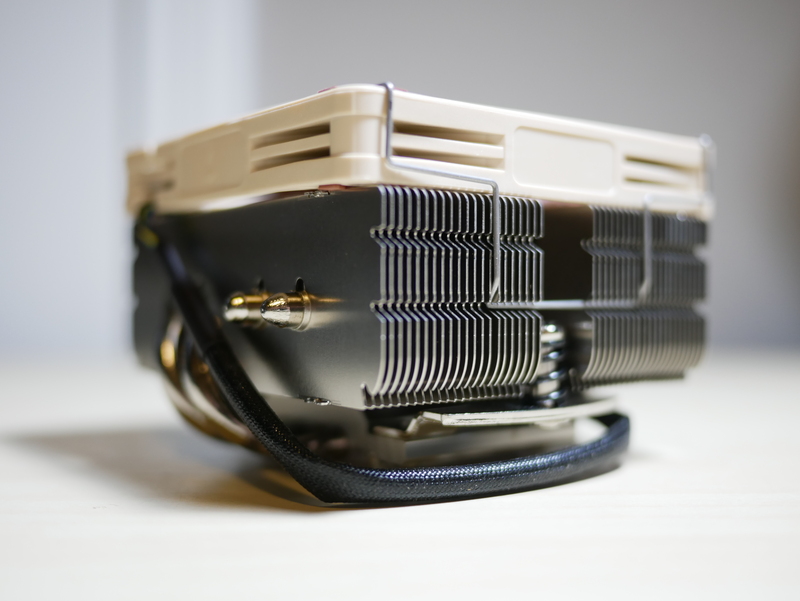 When looking at the cooler, we first notice that it is a down draft cooler with NF-A9x14 fan blowing air straight down through the heatsink. 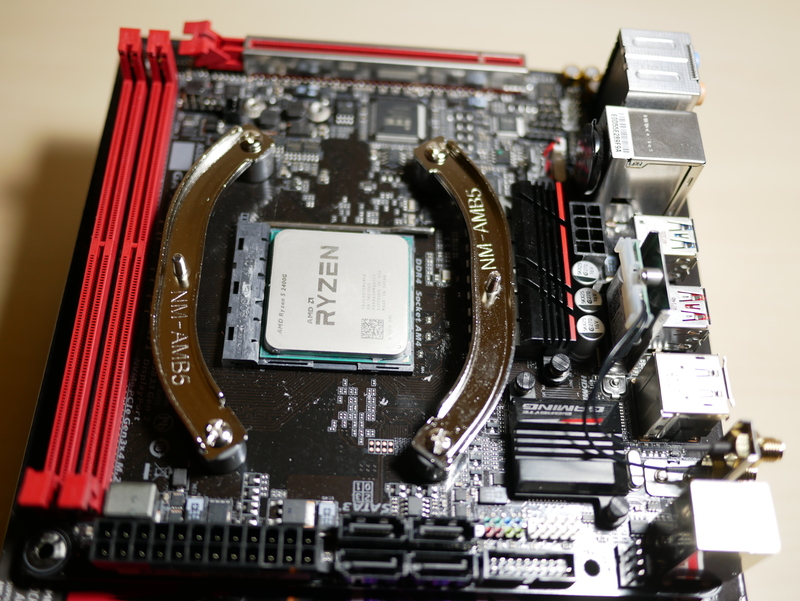 An advantage of this design on an ITX motherboard is that you are also going to be providing addition airflow to the surrounding VRM components around the socket. We can notice that is a very nice nickel-plated copper plate that has 4x6mm heat-pipes that run through it to be able to dissipate the heat. The mounting bracket for the cooler and the NF-A9x14 come already attached to the cooler. The fin array on the heatsink is pretty dense for the small footprint that it occupies. 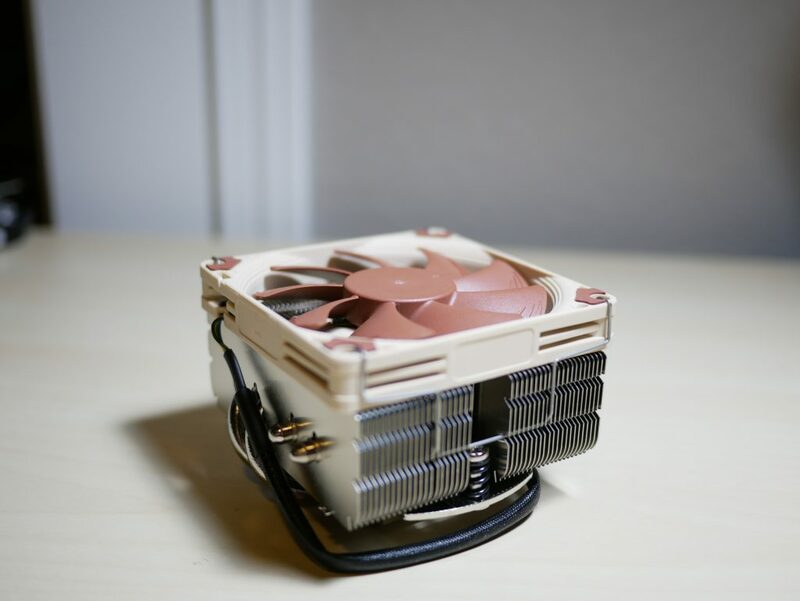 Besides the included fan in the normal Noctua color scheme, the overall design of the NH-L9x65 SE-AM4 is a work of art. There are no LED or RGB included, just a proven high-performance fan, with a sleek and dense heatsink. Installation with the provided instructions were pretty straight forward. First you want to remove the NF-A9x14 fan from the heatsink to be able to access to the mounting screws. 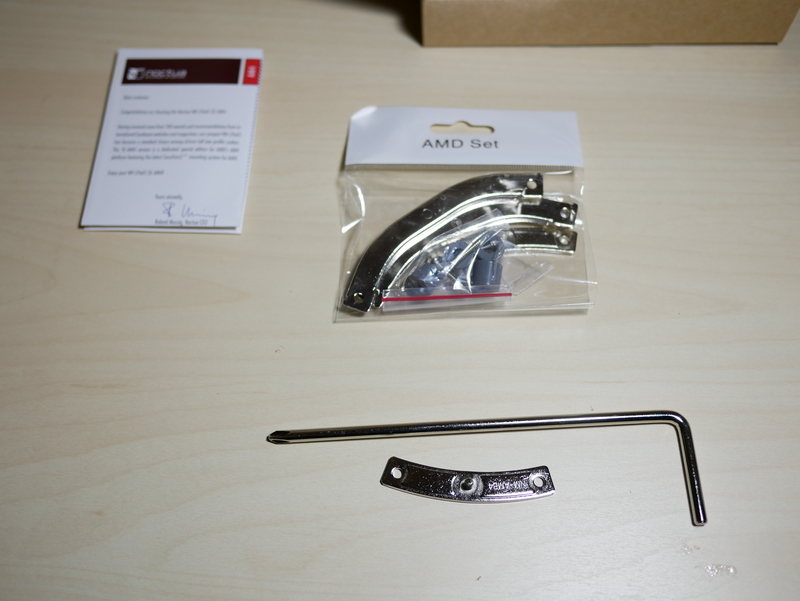 Next you want to remove the included AM4 cooler mounting brackets. The SecuFirm2 mounting system uses the stock backplate. 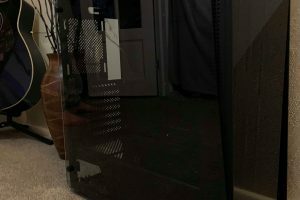 Next you add plastic isolators to not only provide a firm base for the mounting hardware, but it also makes the tension on the mounting holes more distributed. After that, its time to place the mounting brackets on top of the isolators and install the screws. Lastly, you add the provided thermal paste to the CPU HIS and place the heatsink on top of the brackets and secure it down. 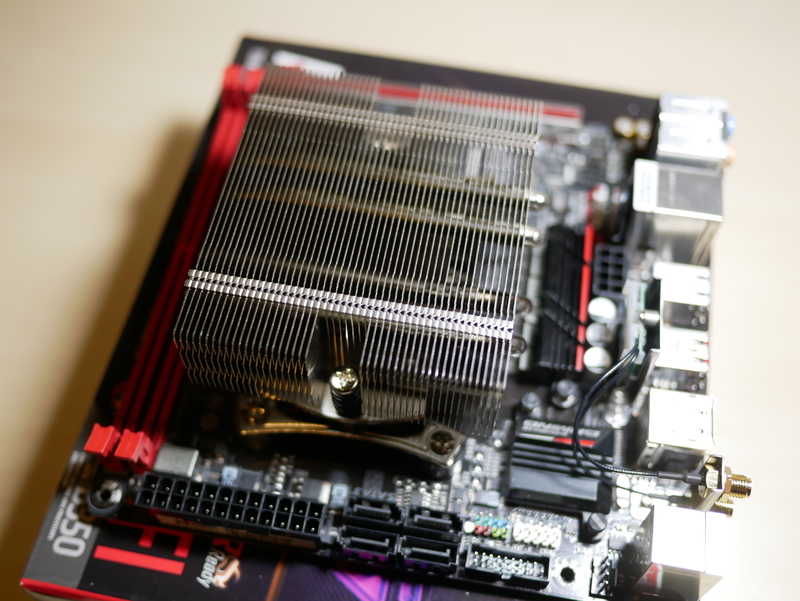 As previously mentioned, you can notice the great amount of clearance around the motherboard socket to be able to access any connectors without the heatsink or fan getting in the way. The following are what I believe to be a great group of real-world representative tests to be able to stress the CPU and integrated Vega GPU and lastly the CPU cooler that is attached. The ambient temperature of the room during testing is 20 C. The testing was conducted with the 2400g stock settings, an Overclock of 3.9 Ghz on the CPU, an Overclock of 1500 Mhz on the GPU and lastly both the CPU and GPU Overclocked. During testing the hottest package temperature is recorded. 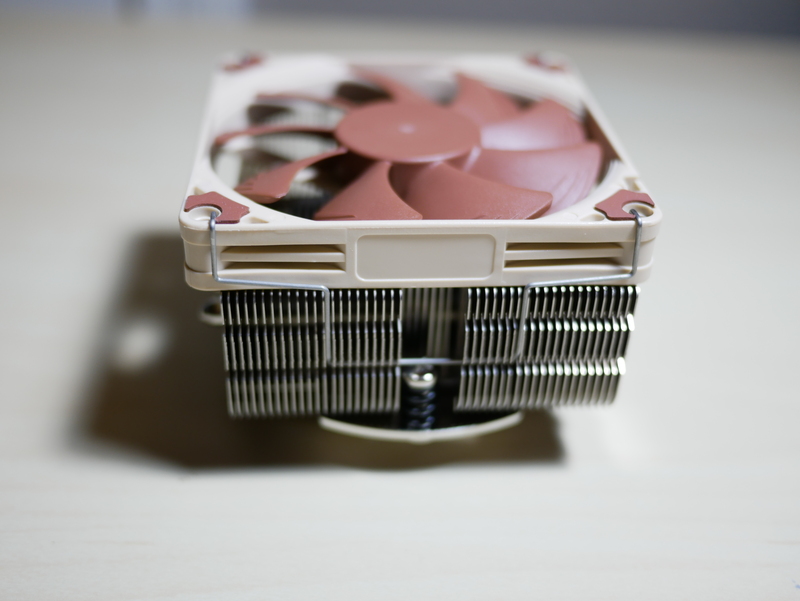 The Noctua NH-L9x65 was able to keep the 2400g at 27.3 C and below during idle in all test variations of idle. While this isn’t cooler than the wraith stealth, the fan was completely silent. When testing Metro Last Light you can see that the Noctua NH-L9x65 is able to shine, keeping the 2400g overclocked on both the CPU and GPU cool with a temperature of 62.6 C.
For Realbench, the Wraith Stealth had consistent temps in the 80’s C, while the Noctua NH-L9x65 was in the high 60’s for the OC CPU run, in the 90’s for the OC GPU run and at a great 69.3C for the combine OC test. 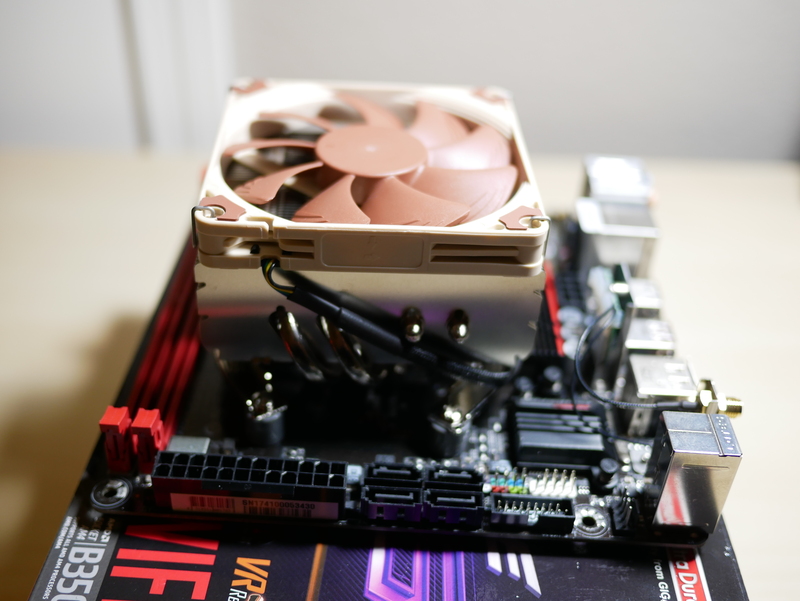 For a game that is primarily used as a benchmark, the Noctua NH-L9x65 was able to keep the 2400g (1500 mhz on the GPU) at a slightly cooler 74.6C C, compared to 75.1 C with the Wraith Stealth. For Rise of the Tomb Raider, the Noctua NH-L9x65 was able to keep up closely to the Wraith Stealth with a temp of 61.1C during the OC GPU run, compared to 59.8C with the Wraith Stealth. During testing of Cinebench R15, the Wraith Stealth allowed the 2400g (GPU 1500 mhz overclock) to climb to a toasty 93 C after one run. The Noctua NH-L9x65 under the same overclock was able to maintain a maximum of 83.8 C after three runs. Bottom Line While this CPU cooler is not as great at dissipating heat compared to a large CPU tower cooler, for its amazingly small footprint and maximum height this cooler is astonishing. 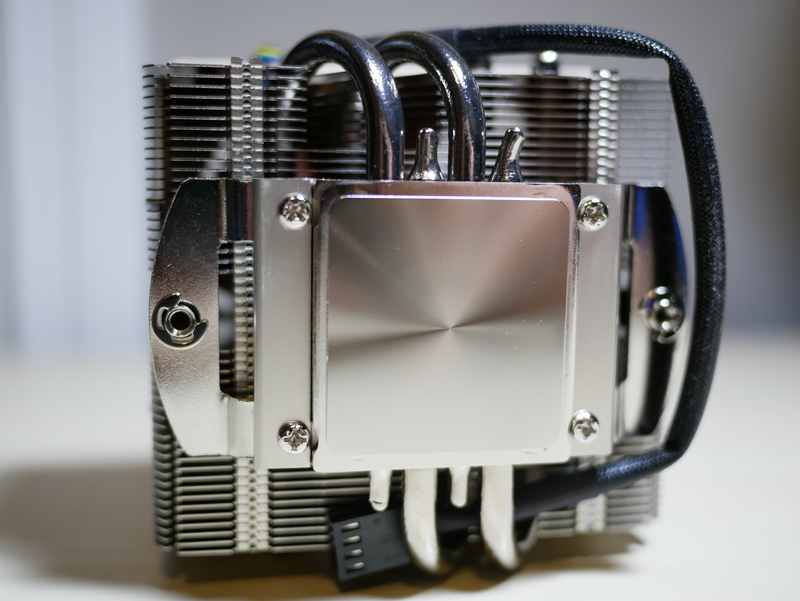 If you are looking for a cooler to keep your CPU temps under control in a Small Form Factor case, you need to make sure this is the cooler in your build.